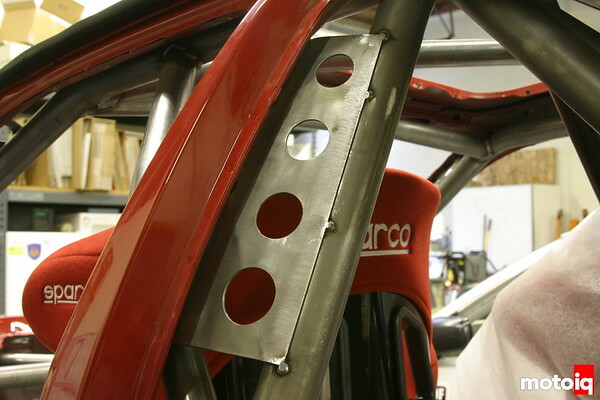 In our first installment of project Spec-V, in an effort to turn an unloved econobox into a sharply honed time attack weapon, we stripped our car to a bare shell and started construction on a roll cage. 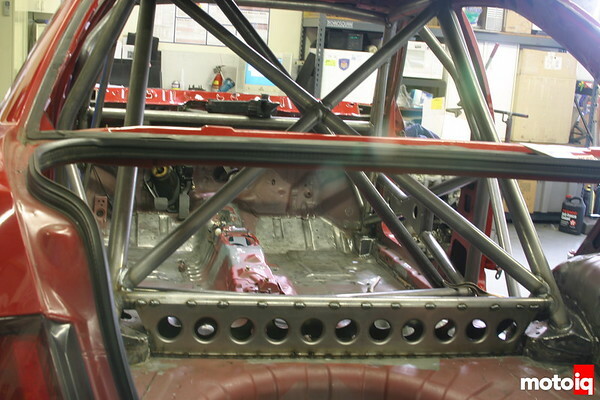 The roll cage is more than just a structure to protect the vehicles occupants in a crash; the roll cage is also the most important part of a race cars suspension system providing a ridged platform for the suspension. The chassis must be as ridged as possible for the suspension to be sensitive to adjustments and for the suspension to work properly. A flexy chassis is like a huge undamped spring that can cause unpredictable overtones to a cars handling that the worlds best dampers or suspension geometry cannot compensate for. Conversely the cage for all of its stiffness improvements must be light. It cannot weigh down a race car trading mass for stiffness. As we continued work on the roll cage, we added more tubes to triangulate the structure; breaking the cage down to a series of small triangles. The triangle is strong, stiff and minimalist, the most so of all structures. 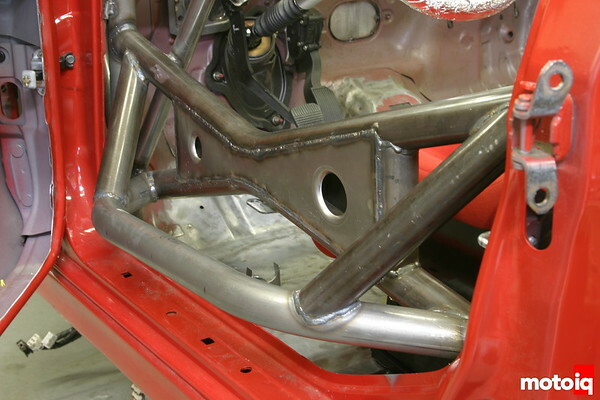 This makes the triangle an elegant form to use for a race car chassis giving the most strength for the least amount of weight. To help keep the weight down, the additional tubes are smaller in diameter and of thinner wall than the mandated by the rules main tubes. Another way to make the cage work more efficiently is to tie it into the unibody. Most modern chassis are unibody construction. A unibody gets its strength from the folded sections of sheetmetal that it is stamped from. The entire stamped structure from the outer body panels to the inner panels and rails contribute to the structural strength. To take advantage of the unibodies inherit stiffness, we tied the cage to it in many places with dimple die pressed plates. The raised dimple die cut holes in the plates give them more stiffness as well as reduce their weight. The dimples act like ribs to give the metal more resistance to bending. The dimple cut plates also look hot. We predict that they will soon become a fashion trend on the street. Perhaps the drift car look will morph into a race car look. We also added a unique feature to the cage, an impact absorbing structure on the driver’s side right behind the driver’s door skin. 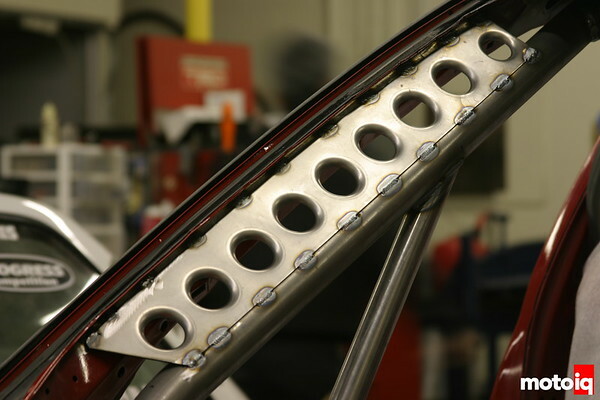 This structure is made of lighter gauge tubing and is designed to crush inward in a severe side impact, taking up a lot of the side loads that can injure or even kill a driver. The cage’s stiff X bars act like the final protection before the driver on the inside of the crush zone. By now it should be obvious that safety is very important to us. Besides the cage the next main piece of safety equipment is the driver’s seat. 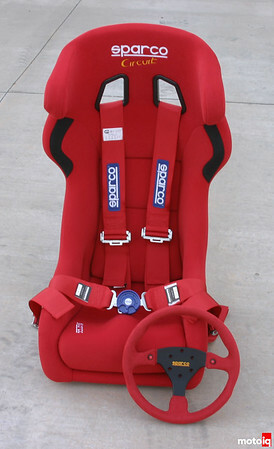 The seat is important for safety because a properly engineered seat holds the driver in place in an accident, absorb impact shock and keeps the harnesses in place in a bad crash. If the seat fails, the driver will helplessly crash around in the interior of the car facing severe injury.